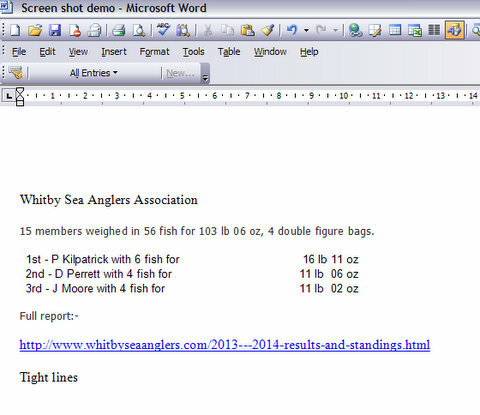 With reference to Whitby Sea Anglers Association Facebook page (Friday 3rd Oct 2013), below I was asked to demonstrate the use of 'Ctrl' & 'Prnt Scrn' using a quick IT lesson. By pressing the 'Ctrl' and 'Prnt Scrn' keys together on your computer keyboard, an image, known as a 'Screen Shot' is captured of what you are looking at on your computer screen. In order to 'Save' this image it must be 'Pasted' into a suitable program, such as 'Paint'. 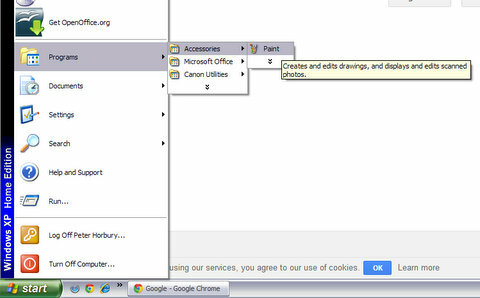 By clicking 'Start' - 'Programs' - 'Accessories' - 'Paint'. It is recommended to have your chosen program 'Open' in the background to save time. 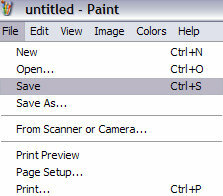 The 'Screen Shot' can be 'Pasted' into Paint or another suitable program. Once 'Pasted', it must be 'Saved'. Once 'Saved' to your photo library it can be retrieved later. Here is an interesting post on WSAA Facebook page. Reading the above post to WSAA, it appears we are invited to 'Share' but why then when I did were they deleted? In order to save time and correct any spelling mistakes, I would suggest writing out your post in 'Word' or any other suitable 'Word Processing' program. 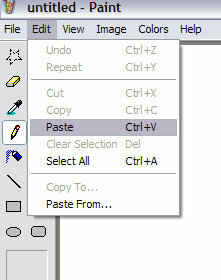 Once 'Saved' you can 'Copy' and 'Paste' it (again if it is 'Deleted'). Once 'Posted' on the Forum or Fbk page, you use the 'Ctrl' & 'Prnt Scrn' to capture your posting, as below, like a check-out receipt. 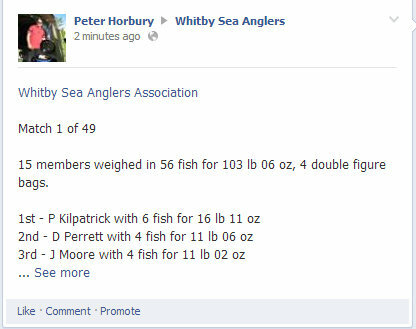 It is also recorded on your (my) personal Facebook Time Line, as demonstrated below in this Screen Shot with the time stamp 13.40 hrs (Thursday 3rd Oct 2013). Having noticed my first 'Post' had been 'Deleted', it was 'Posted' again and recorded with another 'Screen Shot'. This was also deleted, now no one can say I have not tried to 'Share'. 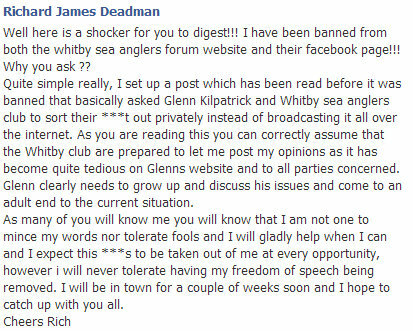 There was a reply from Glenn waiting for me the following morning, which reads. WSAA Treasurer reminded me that he had agreed with Glenn that he could have the top 3. 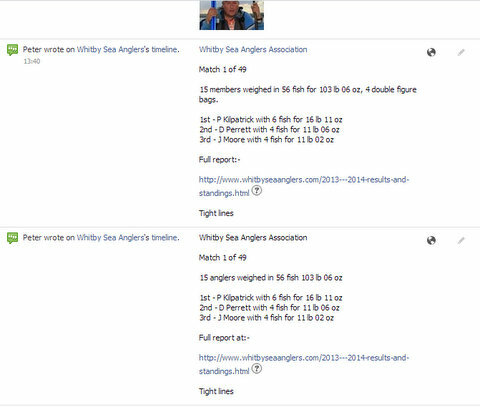 The olive branch was offered 4 weeks ago and I have attempted to 'Share' with 'Whitby Sea Anglers' as agreed by WSAA Treasurer, but I think you will agree that the tone of the reply with the words and in particular the stress is on the word 'if'. 'if you want to link your site that you post'....... means that all future posting will be 'Deleted' unless I/we comply. I will make another attempt on Monday 7th Oct 2013. 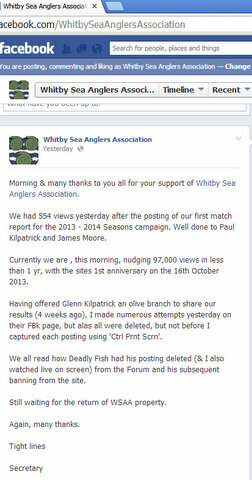 A reminder of what happened to Deadly Fish (and he isn't the only one to have had posts relating to Whitby Sea Anglers Association deleted on the Forum!) but he is the first that I know of to be banned from the Forum.